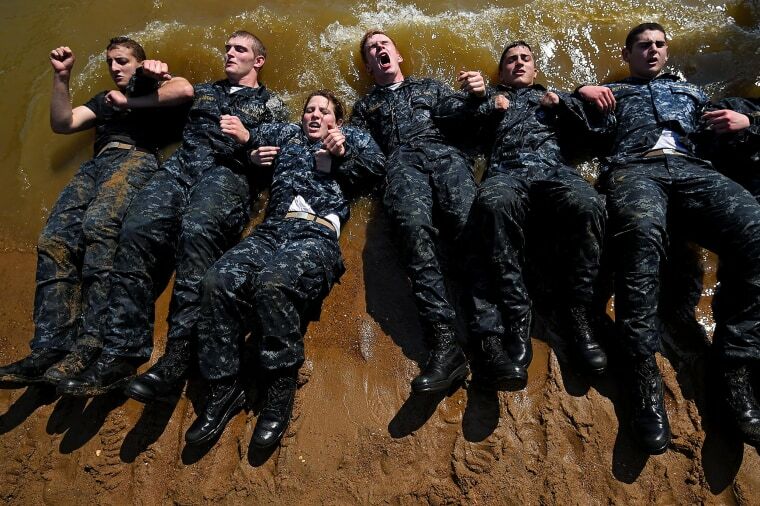 Members of the United States Naval Academy freshman class do sit-ups at the wet and sandy station during the annual Sea Trials training exercise at the U.S. Naval Academy on Tuesday in Annapolis, Md. For 14 hours, the class, also known as Plebes, worked as a team to complete many grueling physical and mental challenges that help prepare them for real-world experiences and reinforce leadership, bonds, trust, and teamwork. The challenges they endured include a two-mile regimental run, ground fights, water tactics, aquatics challenges, and survival skills, amongst many others.